All posts by German V.
SWOT Analysis is a powerful tool for structured planning when analysing the Strengths, Weaknesses, Opportunities and Threats of a business , venture , project or particular situation. The method is very straightforward; it consists on specifying the subject or object (business, project, person, industry, etc.) and the objective over it, for later analysing the internal and external factors positive or negative to reach the objective. The SWOT Analysis Basic Diagram consists of a 2×2 Matrix, where each quadrant is dedicated for each initial (S, W, O, T). The diagram can be explained by the effect over the opportunity (S,O are helpful, W,T are harmful for the objective) and by the factors that have impact over it (S,W are internal factor while O,T are external factors to the objective). 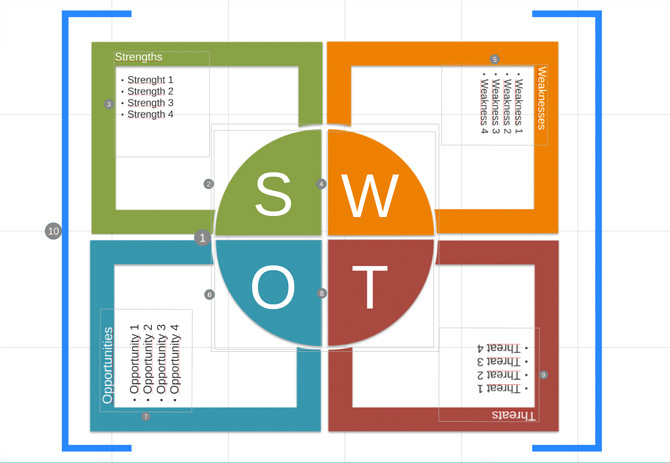 The Free SWOT Prezi Template is a flexible SWOT diagram, ideal for different purposes, ranging from lectures about strategy and business till real consulting, where consultant need to present their analysis findings. Frames for each letter. The Prezi Template Zooms into the Letter. Ideal for introducing the topic to analyse. Frame of Detail. The Free SWOT Prezi Template is designed to be generic and also provide detailed content if necessary. For this reason each concept is described in a separate coloured Box, matching the letter quadrant. Each box has a Title and a Bullet list. This box content is inside a Prezi Invisible Frame, allowing the user to customize its content with more text, or multimedia matching the analysis, ranging from video, embed images or even data dashboards. Transitions. The transition from frame to frame is animated. If you can see the picture above, the text is placed following the path. The Template is Free To Use and adapt. You can find it at the following link. 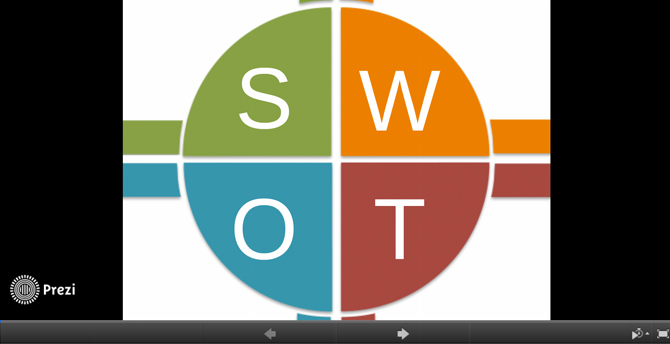 Enjoy the Free SWOT Prezi Template. Share with us your comments.